The Writing Class is an interesting novel. For much of its first half, it feels like light-hearted women’s fiction – a study of the standard “types” that fill writing classes across the world. The second half, however, ventures into cosy mystery territory, when the nasty pranks being played on the class’s members lead up to murder. I think it was this dual nature that limited my appreciation of the work. I could enjoy both aspects separately but, together, they both ended up feeling a little lacking. 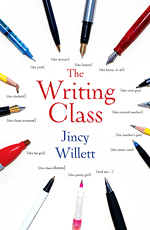 As a novel about a middle-aged widow, a published author who has not written for years, The Writing Class initially feels promising. Amy is a multi-faceted protagonist who feels very real, and her situation as a writing teacher who no longer writes is interesting. At first, it seems like the reader will be treated to similar character explorations of the large ensemble of students who join her class, but unfortunately this is one of the areas in which the novel falls short. Of the students, only Carla feels truly three-dimensional. The rest are mere ideas – hinted at, but never really fleshed out at all. You know that a cast is too large for its story when you confuse one character for another and feel surprised when a name is mentioned, because you’d forgotten that character existed. This kind of thing works (just) in the standard And Then There Were None-esque whodunnit novel, because the reader is more invested in working out who the killer is than in the characters themselves, but it felt like The Writing Class was attempting to be more than that, and the lack of developed characters greatly hindered this ambition. As a whodunnit, The Writing Class is just too slow to get started. 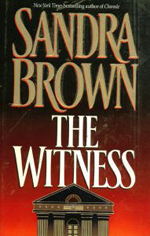 Although mentioned in the blurb, the first hint of murder doesn’t happen until well into the novel. The motive isn’t sufficiently explained and the overall pacing is just off. Readers looking for a good mystery will likely struggle with the long lead-up to the crimes, not caring much for the development of Amy’s character and the glimpses Willett offers into her lonely and solitary life. The action picks up in the second half of the book, but there is not a great enough pay-off to make up for the amount of time needed to get to the denouement. The Writing Class is not a bad novel, by any means. I was actually quite entertained by it most of the time. My issue is more with the fact that I felt like it could have been better than it actually was. It’s an interesting read and a nice way to pass time on public transport, but it’s ultimately quite forgettable. I’m amazed that there aren’t more Young Adult mysteries out there. It’s such a well-loved genre when it comes to junior and middle grade fiction, what with the massive popularity of the Enid Blyton mysteries and series such as Trixie Belden, Nancy Drew and the Hardy Boys, but then there’s a real hole in the market in the section between those books and their adult counterparts. I was excited, therefore, to discover A Pocketful of Eyes. 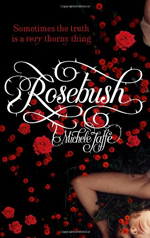 I knew of Lili Wilkinson from her excellent Pink and was very pleased that she had produced an Australian, Young Adult take on the murder mystery. Just like the stories that are regularly referenced in the novel, A Pocketful of Eyes is great fun. There’s an ever present sense of its place in the world of the whodunnit, but Wilkinson is also aware at all times of her audience. There’s no stuffy Poirot here. The protagonist, Bee, is just as keen a detective as her literary ancestors, but she’s also very much a teenage girl. Her sleuthing is often derailed by her growing crush on her sidekick, Toby, and she has her geeky mother and her new boyfriend to deal with as well. I knew I’d love A Pocketful of Eyes from the moment that it started talking about Bee’s childhood obsession with Trixie Belden. I, too, wanted to be Trixie when I grew up, and I received far too much pleasure from the references to her and the book series throughout the novel. I have to wonder whether Wilkinson was also a big childhood fan of junior mysteries, because they are all spoken of with such love. The mystery itself is nicely paced and cleverly constructed. While I picked up on the murder weapon reasonably early in the piece, due to the various hints given in the pages, I had not predicted the other details of the death at all, which is always good. (To be fair, I am not the type of person who tends to think a lot about whodunnit, preferring to let things unfold at the author’s pace.) As with most books in the genre, the reader has to suspend disbelief a little, but I think that’s part of the fun of mysteries. There’s an escapist element to lay detectives that really appeals to one’s own, personal sense of potential adventure. 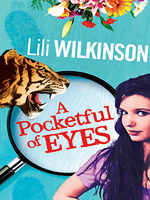 I wasn’t sure what to expect of A Pocketful of Eyes, given the aforementioned lack of YA mysteries, but was very pleased to find that I enjoyed it very much. I’d love to see more books about Bee, or at least a few more whodunnits from Lili Wilkinson. 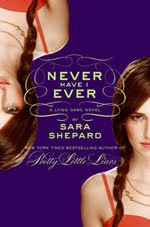 With Never Have I Ever, her second instalment in her The Lying Game series, Sara Shepard keeps the positives of the first book and cuts many of the negatives, leaving us with a better book overall. While I enjoyed The Lying Game, its sequel really drew me in and I think I’d now have to call myself a fan of the series. All of the characters from the first book return for the second, but the big difference here is that the Twitter Twins, Lili and Gabby, play a much bigger role. Initially very annoying, they slowly become more likeable as the novel progresses, much as Laurel and Madeline continue to develop and become more-rounded characters. (Charlotte, in contrast, seems to slip into the background.) Most of all, however, Sutton seems to come into her own in Never Have I Ever. With the back-story out of the way, her strong voice is able to take over, so we find her cheering Emma on and groaning at her mistakes and truly feeling like a real character. Although it’s interesting to see Emma becoming a little more like her twin as the series progresses, it’s Sutton who seems to have the most room for character growth. Once again, the mystery is at the forefront of the novel, and much of the plot is concerned with the identification of new suspects, along with a few new threatening situations that Emma finds herself in. While there’s certainly a formula to these books, that doesn’t mean that it isn’t fun to watch it play out, even if we do work out the truth long before Emma and Sutton do! Shepard manages to keep the suspense high throughout the novel, which makes this a page turner and a surprisingly quick read. My only real criticism of Never Have I Ever is that there were a couple of inconsistencies with the continuity. For instance, Emma uses Sutton’s iPhone at a point where it was still confiscated by her parents and, towards the end of the book, Sutton looks at Emma despite earlier stating that she can only see the world through Emma’s eyes. While such mistakes tend to draw the reader out of the action temporarily, however, they don’t detract from one’s overall enjoyment of the book. Never Have I Ever was a lot of fun and its mystery well and truly has me hooked by this point. I’m definitely looking forward to reading Two Truths and a Lie. The Lying Game has an extremely interesting premise, in that it’s narrated by a dead girl who is watching the action through the eyes of the identical twin sister that she hadn’t known existed. 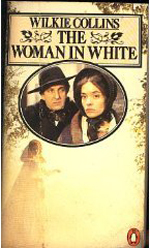 Therefore, while it is essentially told in the first person, it usually reads like a third person perspective, with the ghostly Sutton relating Emma’s experiences as she tries to fit into Sutton’s life and work out what has happened to her sister. It sounds a little confusing when described and it took me a while to adapt to the concept but, once I did, I found it a very clever take on the whodunnit format. The plot of the novel is very engaging, and I quickly found myself guessing at who might turn out to be Sutton’s murderer. I found Sara Shepard’s mystery writing to be quite reminiscent of Agatha Christie, in that she is very good at ensuring that there are numerous suspects, all with very good reason to want Sutton out of their lives. I certainly have my own strong suspicions about the murderer, but I will most likely be proven wrong! While Emma is a likeable character, the twin she is pretending to be is very much not, which is one of the most interesting things about The Lying Game. Ghost!Sutton has very little memory of her life, meaning that she discovers just how unpleasant she was at the same time as Emma and the novel’s readers do. I think this helps the character to be a lot more sympathetic than she otherwise would be, which is important in a book that is populated largely by people who aren’t very nice. There are a few things that aren’t very believable here – like Emma being able to bluff her way as a tennis captain despite only having played the sport on a Wii – but it’s not so bad that it detracts from the plot. And it’s the mystery here that’s the book’s biggest strength. In the end, the characters and Emma’s charade are secondary to the question of who killed Sutton. Unfortunately, the answer to that question is not revealed in this first book of the Lying Game series. 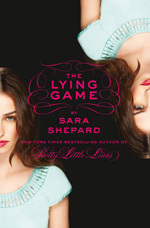 Indeed, The Lying Game does not exist very well as a stand-alone novel, lacking as it is in any real conclusions. Luckily, the story is interesting enough that I’m happy to read on to get the answers I need.